You probably do not know Sean, Jamie, and Reesa Stutzman. I believe it even less probable that you have heard of Krabbe Leukodystrophy. 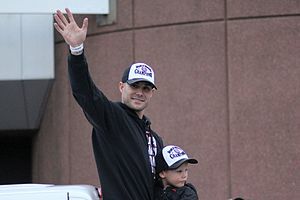 Fortunately, Skip Schumaker knows both the family and a little about Krabbe Leukodystrophy. Even more importantly, Skip has stepped up in a big way to champion the cause of Baby Reesa who has this rare, inherited degenerative disorder that affects the central and peripheral nervous systems. As you may already have guessed, this disorder has no cure. Krabbe Leukodystrophy typically claims the life of the child before age 2. Knowing only that piece of information is enough to send chills down the spine of this father. To watch your child die in any manner certainly must be one of the cruelest sights a human being can witness. To watch your child slowly and gradually lose one motor function after another must be heart wrenching. People who chance has cruelly selected to endure such a thing deserve some kind of retribution. If nothing else, parents who go through what the Stutzman family is going through should have at least a glimmer of hope. If not for their own child, then maybe that hope might be realized somehow for another child somewhere in the world in another time. As though to add insult to injury, the treatments required to keep a child with Krabbe Leukodystrophy alive as long as possible can create a gaping financial hole. Start at approximately $70,000 and then work your way up in order to estimate the total cost of treatment which does not include sleepless nights and long days as care providers. Imagine opening up a hospital bill for a treatment that was both necessary and irrelevant to the final outcome. “Staggering” might be apropos. In the vernacular I reserve for only the worst of times, a lot of 4 letter words come to my mind. Maybe that is why I have so much respect for the Stutzmans. Sean Stutzman speaks in glowing terms of both Skip Schumaker and the wonderful members of Cardinal Nation that the family met during Mike Matheny‘s Catch 22 charity golf tournament. For someone facing such a grim reality, Sean puts on an incredibly brave face that most surely must mask a sadness which knows no limits. Tickets for the event go on sale July 16th at 8 am. In order to purchase tickets, please call 636-978-0461 or 636-980-3740. Each purchaser is limited to purchasing 4 admission tickets along with 1 autograph ticket of each current Cardinal with admission ticket purchase. Basically, it costs you just $10 to get in the door. Some autographs require an additional autograph ticket and some do not. Here is the information regarding who will be there and the price for each autograph ticket. 4 admission tickets, guaranteed 1 autograph of all athletes, Rams, Blues and Cardinals tickets along with restaurant gift certificates for $1500. There will be only 5 of these sold. This event is being held at the SunRise United Methodist Church, and additional information may be found on the SunRise UMC website here. To learn more about Krabbe Leukodystrophy, please go to www.babyreesa.com for more information about this terrible medical condition, the beautiful little child stricken with it, and the awesome family whose universe revolves around their little girl. 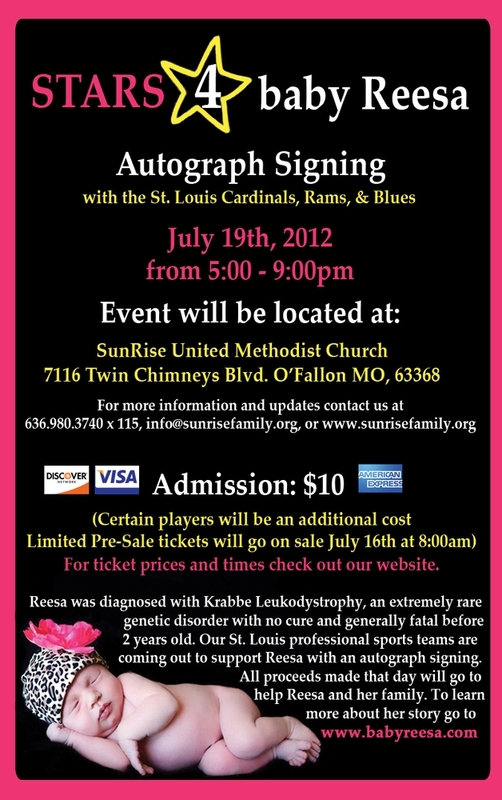 Consider this my impassioned plea for our brother and sister United Cardinal Bloggers and Baseball Bloggers Alliance sites to join us in spreading the word about this family’s story and Schumaker’s charity event to benefit Baby Reesa. FYI: SunRise UMC is located at 7116 Twin Chimneys Blvd., just off of South Outer 364 (next to Delmar Gardens) at the entrance of the Twin Chimneys subdivision in O’Fallon, Missouri. I cannot thank you enough Dennis for your kindness, understanding and sharing of Our little Angels plight. I am Mike Stutzman, Reesa’s grandfather. I now understand what Skip has shared with us for years. The love and support from the people of St. Louis and Missouri as well as all of Cardinal nation is indescribable Dennis you are a great example of this quality and my family thanks you. God Bless. Very kind words, thank you. I like to think that compassion for others is something shared by more people than we can ever imagine. 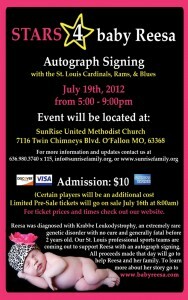 Reesa’s story struck a chord, and I sincerely hope that Cardinal Nation turns out en masse to support the event. Thanks Dennis, means so much that you took time to publish this. This city is truly amazing. I asked for some help in raising awareness and generate a few dollars for my friend and his family, and never did I imagine it would turn into something like this. The way this city has come together for someone they don’t even know is incredible. This would not be able to happen in any other city and so blessed to be a part of this community. Thanks again. I hope that more than just a few dollars will be raised through all of this. I believe that Cardinal Nation would not have it any other way. I know that I’m planning on attending the event. Thanks for hosting it. I just heard about this event on FSMidwest while watching the Cards game. I unfortunately can’t attend but would like to make a donation. Where can I do this? Your family and Baby Reesa are in my prayers. God bless you. Arletha, you can go to http://www.babyreesa.com and donate there, or you can contact SunRise UMC at the numbers above to ask them how to donate to the event. Thanks so much for reading and offering support for the Stutzman family. Thank you for getting back with me and please keep us posted on Baby Reesa. My prayers to all involved. I will be at the event and will be praying for Baby Reesa, the entire Stutzman family and for all families affected by Krabbe disease. I pray that a cure will be found so that no other family has to go through what the Stutzman family is going through. God Bless you all! Thank you so much for attending, Kelli. Great to see so much positive feedback from good people who just happen to be baseball fans. 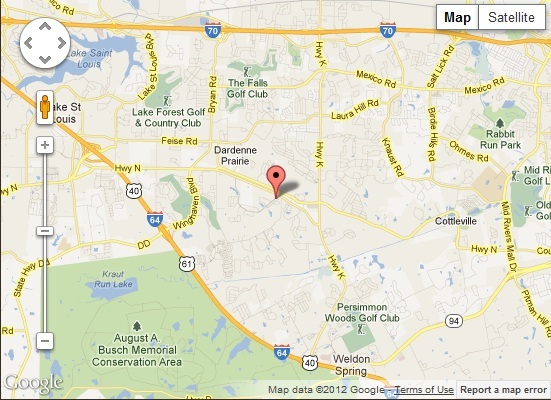 Thank you for posting about the Kelly family. I remembered that someone in the NFL had a child with this, but I couldn’t remember who it was. I’ll pass this on to the Stutzmans. Thank you so much for your support. One of our first contacts was with Hunters Hope. Hunter was Jim Kelly’s son. They have been a great help to our family. Candice- Sorry to hear about this. I highly recommed a Caring Bridge page as a way of creating a one stop information source and a means of allowing people to offer assistance. As the godmother/Aunt I can’t express enough thanks for what Skip, Cardinal fans and just complete strangers have done for our family. A couple of months ago Skip said something that will always stay with me. Baseball is his job but beyond that it’s given him a platform to help those in need. Never did he or our family realize it would hit so close to home. Skip has used this platform to not only help our family but many others. It’s important to recognize that platform and the one’s that use it for the way Skip has. This is truly a journey unknown to all of us but we all have the same goal. We are very thankful for the friends, days and gifts we have been given through support. Truly the unthinkable happened within our family but our angel is here for a purpose and our goal is to build awareness and assist other families that are going through this. We are here for you as much as you have been here for us. 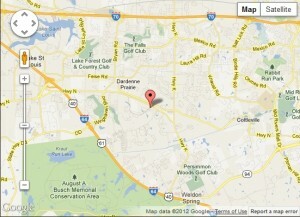 If we can help your family or if you would like please follow our journey on http://www.babyreesa.com. Thank you so much for reminding us all of what Skip has accomplished using baseball as his platform. St. Louis summers are full of charity events of one kind or another, and it’s hard to choose which ones to support when a choice must be made. Skip’s level of personal involvement in this one makes it an easy call for me. Since this blog and various social media outlets provide a platform for me to be a conduit of information, I chose to really focus on Reesa’s story to shed even more light on such a devastating medical condition. I hope what little I have done in some small ways helps, even if it just means that your family knows that more people care. My great-granddaughter has just tested positive for Krabbe’s Disease. They live in St. Charles, MO. I was wondering if I could have an email address for Jamie Stutzman. I have read her blog but could find no contact information there and was wondering if I could some way for my granddaughter to connect with her. As you can imagine, we are all devastated. Nancy – I’m sorry to hear about your granddaughter. That’s just not the kind of news people should have to hear.